Almost four years ago a younger, slimmer and less battle-damaged Ruari O'Toole received an email from Rum and Reviews editor Craig Heap inviting him to take part in jointly reviewing a hangover prevention pill called Alcotox. He rose to this challenge like an alcoholic Rapier missile because he's always liked a sip, has Ruari. Soon a night of mind-erasure took place, in which Ruari and his friend Carl got significantly drunk on a variety of beers and ciders, and which ended in Ruari being adamant (to this day, in fact) that he witnessed a human-faced cat somewhere in Cramlington's leafy Northburn estate. The next morning Ruari awoke and turned in his copy, along with beer writer Chris Hall, and the result was a great bit of journalism that led to the company that made Alcotox emailing Editor Craig and dropping this bag of ego food on our plates. me and my winehead mates to Chaucer and Keats. Jesus Christ man shake your head. The Rum and Reviews days are gone now, and from what I can tell you can't even access the old website any more; it's trapped behind a big "your domain name has expired like years ago, quit living in the past" message, but a recent discussion at my day job of cats that look like people dragged me right back to that night, and to Old Tom, a strong dark ale I drank then that has a cat on the label and most likely led to either a false memory of a cat with weird little human eyes, or in fact summoned an unseelie catman from Dark Cramlington. Resolving to carry out the ritual again, this time prepared to travel to whichever alternate Hell Zone the cat-thing wished me to visit with it, this reporter acquired the relevant potions from Blyth Asda. The first hit from the neck is dark, velvety smoke. Chocolate fumes that quickly are subsumed within, and then erased by, an expanding miasma of liquorice. This quickly overwhelms the nose, a black candy noose around the senses. 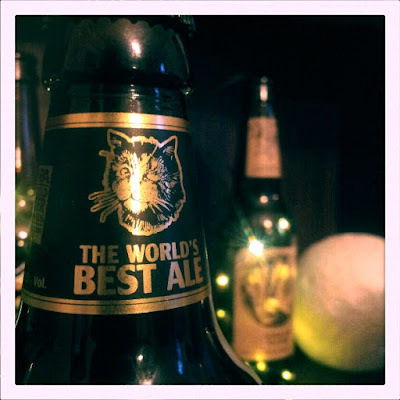 My concern that the beer I remembered being excellent as a 29 year old would turn to ash on my thirtysomething tongue unfounded, the time came to pour out this ashed-clawed, 8.5% abv cat, this Victorian monster with a pedigree dating back to 1899. 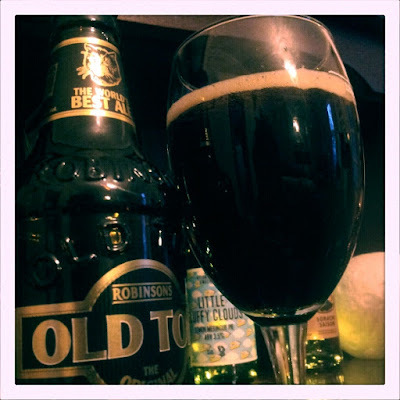 From a pour much lighter and less petroly than I had expected, the glass begins to fill with purplish-black, lightened at its base by swirling carbonation which buoyed up a just-shy-of-white head. The scent from the glass; rum-drowned cake, all sugar and menace. Monstrous and lumpen figs hover in a haze of marzipan, and to bite through the foamy head and into the black mirror beneath unleashes a burning tide of unfettered and sour black forest berries. Some beers hide a strong alcohol content well, tricking the drinker into slamming back a ton of them before biology, chemistry and poor impulse control conspire to bring about a massive order from a zero-star pizzeria and several 3:00am voicemails left on the phones of all of the drinker's mates. Old Tom hits the drinker in the mouth with its alcoholic volume, burning like a flamethrower through a pillbox gun-slit. The label tells the drinker to enjoy the beer carefully, as if this needs to written in words as well as in pyroclastic heat-rush. Old Tom tastes of midnight decadence, of fruit that has gone beyond fulsome and into decadent obesity, with a richness that catches at the back of the drinker's throat. As the carbonation dies the way is cleared for the senses to pick up just how thick and sticky the mouthfeel is without the pixieish bubbles pepping it up. The bitterness increases when there's just over a finger left in the glass, as the old cat unsheathes its claws, its fur sticking up like lightning bolts. The final mouthful is a flash flood of fecund fruit across the tongue, and then there is silence. Somewhere a cat with the features of a human wanders the red brick cul-de-sacs of Cramlington. Of this, after a bottle of Old Tom, I am convinced. And as a bonus, here's the piece I wrote about Alcotox (annotated with some retrospective knowledge), which makes this quite a long read but also allowed me write a blog entry title that looked a bit like "Arsenic and Old Lace." Sometimes being your own editor is pretty good. Some time ago the idea of the Rum and Reviews gang testing out an anti-hangover supplement was mooted, and as I approach thirty and hangovers seem to beat me up harder each time I leapt at the chance, keeping in mind that, as several of my friends pointed out to me, they “probably wouldn’t work”. I already have a sure fire hangover preventer (other than the dreaded and draconian “not drinking”) which takes the form of ordering an horrifically greasy 14” stuffed crust meat feast pizza at two or three in the morning and inhaling it before I go to bed [This refers to a joint called High Pit Pizza. I stopped eating there about a year ago after eating a pizza that made me throw my guts up like a human sprinkler all over my hallway after one bite. Although I did finish it the next day.]. This poses a few problems though; first among them is that if I use this powerful healing spell more than once a month my shirts tend to get a bit tight, and also pizza isn’t the cheapest of commodities. A magic pill that meant that I didn’t have to suffer the agony of hangovers and the irritation of upsizing my workwear collection would be mana from some kind of alcoholic heaven, and I was a little disappointed that hovering cherubs didn’t appear and shotgun beers while the Post Office clerk handed over my “medicine”, a supplement called Alcotox that boldy claims on its label to prevent hangovers. My first impression on opening the bottle was that Alcotox stinks. Even with the film covering still in place the retch-inducing yeasty smell of the capsules was mildly overpowering. Once I had put my guts back in my body and torn away the plastic sealing the bottle’s neck I was greeted by the sight of a bottle full of Hollywood narcotics. I’ll get onto Alcotox’s actual performance soon, but irrespective of this stuff’s efficacy I would never risk taking a single one of these tablets in public. It’s easy to imagine Steven Seagal yanking a big plastic sack of these from some dirtbag’s jacket before giving him some excessive street justice. [I tried to find a picture of the pills on my laptop again to illustrate this but couldn't. They were almost an inch long and half-blue, half-white] Bear in mind that the guidance advises you take one capsule for each drink, and begin and end the night with two capsules, and be aware that you’re going to look like an action movie drug dealer. I was aware that Chris Hall’s plan for his experiment was to test Alcotox’s abilities against a range of IPAs of various strengths. I planned to throw myself firmly into the fight armed with an array of darker beers, firmly intent on mixing my drinks in a dangerous fashion. I had decided against following the instruction to drink water between each drink, as nothing ends a drinking session for me quicker than getting bloated [I can power through the bloat these days, which may account for my waist size going up four inches]. I kicked off the night with Guinness, which always gives me terrible hangovers [and still does] and leaves me with a stomach like the aftermath of the Somme, and then followed that with a bottle of Old Tom, taking the required pill with the first gulp of each drink. 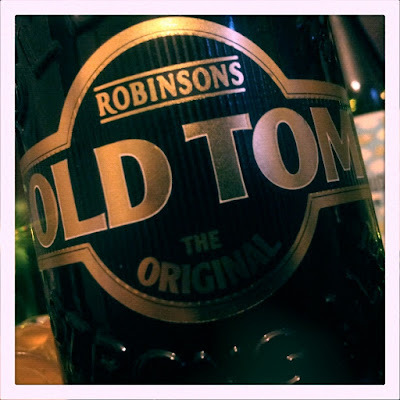 Old Tom packs a punch, a delicious 8.5% abv ale which has won a million awards for being the best beer ever, and I had a few beers of a similar strength lined up to follow it. I had decided earlier that this experiment would be an exercise in “testing to destruction”, in case it’s not obvious! I followed this with Innis & Gunn Rum Finish beer, a 7.7% abv night-finisher, then piled three different kinds of brown ale on top of it. I had reached the point where I was certain a hangover would appear when my friend began to force cider down my neck, using such forceful language as “would you like some cider, mate?” and I was sure I would be ruined the next day. Bear in mind that I was live-tweeting my experiments with Alcotox. Here’s the last tweet I made that night. The next morning I was fine. FINE! I felt amazing. [The previous two sentences actually made it onto the Alcotox website as a testimonial and I only found out about this a few days ago] On the way home the previous night I sent my friend a private message on Facebook that went a little something like this “Natw can I come poverty tintype and gerty my phone charger,? Love you maaaan” and now I was unbelievably fresh! I was quite thirsty, but I wasn’t even approaching the level of cottonmouth I normally get on a hangover. I didn’t have a headache. I wasn’t nauseous. On returning from my friend’s house I have it on good authority from my fiancee [Haha] that I tried to take the end of the night double dose but coughed the pills up, but she was clear that I didn’t vomit and I’m sure this was down to nothing more than the coating making them stick to my tongue. On a second attempt I managed to down the last two pills of the night, and then went to bed. I woke up with a bottle of Dr Thunder (Dr Pepper for the cash-strapped) next to my bed, but it was freshly opened with very little gone. Normally in an attempt to stave off a hangover I would have been hydrating like crazy before bed, and I would still have woken up feeling worse than this. I have to say that there were other variables at work, like the fact I had played sports that day [I used to be vaguely decent at badminton. Laugh all you want] and I rarely, if ever, have a night of drinking after exercise. This might have had some kind of effect on my metabolism which helped me fight off the hangover. I also walked home [it was like less than a half mile], which I rarely do due to having a regular designated driver on nights out, and again this might have helped in some way.